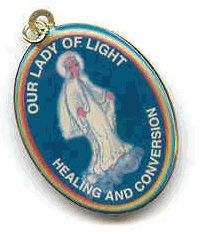 Brass medal 1″ x 1 1/2″, covered on front with picture of the painted image of Our Lady of Light. Back has picture of the Pieta and the words of Our Lady over her Son’s body. Both sides encapsulated in smooth epoxy.